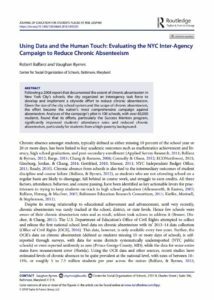 Following a 2008 report that documented the extent of chronic absenteeism in New York City’s schools, the city organized an interagency task force to develop and implement a citywide effort to reduce chronic absenteeism. Given the size of the city school system and the scope of chronic absenteeism, the effort became the nation’s most comprehensive campaign against absenteeism. Analyses of the campaign’s pilot in 100 schools, with over 80,000 students, found that its efforts, particularly the Success Mentors program, significantly improved students’ attendance rates and reduced chronic absenteeism, particularly for students from a high-poverty background.